A few weeks back, after much nagging, I upgraded my Windows 8 laptop to Windows 10. The results so far have been pretty underwhelming. For the most part, not much has changed. The most noticeable difference is that logging in has turned into an infuriatingly slow process. Just selecting and typing in my password seems to take an exorbitant amount of time. From there, it seems to take additional time just to get to a desktop where I can start opening windows and getting to work. It's probably just a few seconds here or there being added, but it's definitely painful. Oh, and I find that Firefox has been doing the Unresponsive thing more often. Of course this is all anecdotal, and who knows, maybe Windows 10 is doing some awesome stuff behind the scenes. Anyway, there is one bright spot in Windows 10. 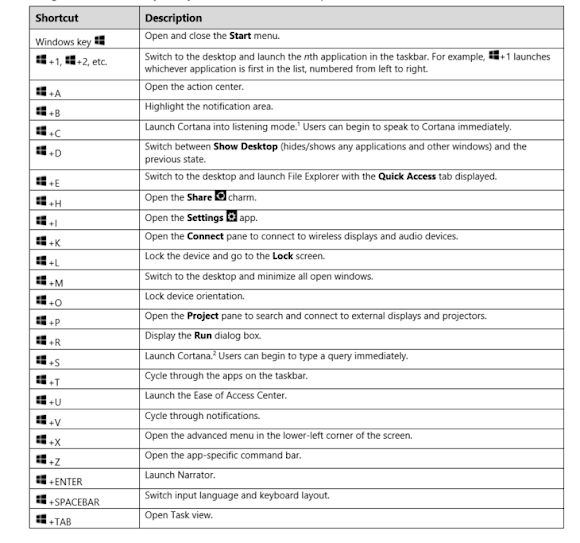 It seems that they've taken the keyboard shortcuts started in Windows 8 and dressed them up a bit more. It's not Ratpoison, but it's an improvement. Windows + Tab - an interactive version of Alt-Tab. This gets points because you can navigate the windows via the cursor keys. It loses points because there's no way to traverse both monitor's worth of windows. It strikes me as strange that you would design keyboard shortcuts in this day and age and not take into account multiple screens. Windows + Shift + D - create a new virtual desktop. Whoo! Windows 10 has finally caught up to FVWM circa 1995. Kidding aside, virtual desktops are a nice edition. Windows + Shift + Left, Windows + Shift + Left - traverse the virtual desktops. Windows + X - open up the Start Menu. I learned about this gem here. I'm not sure why I'd need to get back to the good old Start Menu, but it's good to know it's there. Windows + Print Screen - grabs a screenshot, saves it as a file. Well that only took them like 10 years to add to Windows, yeesh. The traditional method of capturing the screen and storing it on the clipboard may have been handy for programmers, but what a pain for regular users.